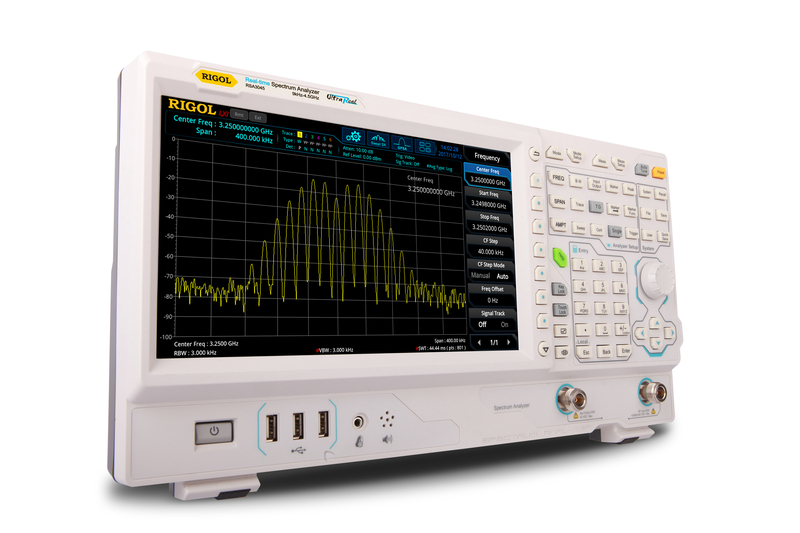 Beaverton, OR - June 12, 2018 - RIGOL Technologies expands its portfolio of RF Test Instrumentation with the introduction of the?New RSA3000 Real-Time Spectrum Analyzer. RIGOL introduced our Real-Time Analysis solutions with the RSA5000 earlier this year. It combined the power of a high performance swept spectrum analyzer with superior Real-time performance unmatched in this product category. Now, with the introduction of the RSA3000, RIGOL is extending its Real-Time Analysis solutions to applications that don't require the high performance or standard options of the performance RSA5000 Series.? Price sensitive engineers looking to bring Real-Time Analysis to their test bench can now get an upgradable, powerful solution at an exceptional entry price. Available in 3.0GHz and 4.5GHz models with available tracking generators, the RSA3000 comes standard with 10MHz of Real-time analysis bandwidth but can be upgraded to 40MHz at any time. With the 40MHz option applied, the RSA3000 delivers the same seamless capture,? minimum probability of intercept (POI) of 7.45 μs, 7 rich visualization modes and powerful triggering capability as the RSA5000 providing a complete real-time analysis package for engineers at lower entry price. The RSA3000 can also function as a traditional swept spectrum analyzer with solid specifications sufficient for most applications.? Resolution Bandwidth (RBW) is standard at 10Hz with an option for 1Hz, noise floor as low as -161dBm, phase noise of -102dBc/Hz, and a full span sweep as fast as 1ms. The RIGOL RSA3000 takes 146,484 FFTs per second providing a minimum 100% POI of 7.45 μs. This class leading performance allows users to confidently capture pulsing, hopping and fast transient signals as short as 7.45 μs and display accurate power 100% of the time. Signals as low as 1 μs can be captured thanks to our seamless FFT capture.? The RSA3000 provides 7 rich data views to allow engineers to visualize the most complex RF environments. Density Displays help to see time varying signals and resolve hidden and superimposed signals in the same frequency band. Spectrogram Displays allow users to evaluate changes in signal behavior over time, especially useful in identifying hopping patterns and characterizing PLLs. Power versus Time Displays show the RF Power for the real time span over a user defined time span helping measure the duration and timing of pulsing signals and characterizing signals with amplitude modulation like ASK. RIGOL Real-time Spectrum Analyzers come standard with an IF output which converts the entire real-time span to a 430MHz carrier.? Using this capability, along with a 500MHz Oscilloscope the user can complete detailed multi-domain measurements when integrating Wireless technologies.? The new RIGOL DS7000 Oscilloscope provides an Enhanced High Resolution Color FFT capability perfect for this type of multi-domain measurement.? Learn more about the RIGOL RSA3000 Real-Time Spectrum Analyzer at?www.49802630.com. RIGOL Technologies is transforming the Test and Measurement Industry. Our premium line of products includes Digital and Mixed Signal Oscilloscopes, Spectrum Analyzers, Function/Arbitrary Waveform Generators, Programmable Power Supplies and Loads, Digital Multimeters, Data Acquisition Systems, and application software. ?Our test solutions combine uncompromised product performance, quality, and advanced product features; all delivered at extremely attractive price points. This combination provides our customers with unprecedented value for their investment, reduces their overall cost of test, and helps speed time to completion of their designs or projects. ?